My whole life change once I got INTO MY FLOW so I want to share my strategies and tricks to save you many years of searching. This workshop is designed to help you CREATE and MAINTAIN hormonal balance and flow in your life. This unique program looks at hormones and a women’s body in such a unique way encouraging women to embrace their bodies and use their cycle to their advantage. What I have found in working on a one to one basis with thousands off women over the last 5 years is that every condition, ailment, fitness goal, challenge or concern that my clients have brought to me to help heal can be connected back to the source of an imbalanced hormone gland. We haven’t been taught much about hormones and if we have it’s been scientific and complicated. I want to keep it simple, informative, original and empowering for women. Awareness is the first step so I have designed this program to give you my successful tried and tested methods just like being in a personal 1:1 session with me. In short let me help you …RE BALANCE, RE ROOT AND RE CONNECT with your body, mind & hormonal cycle in order to live a fulfilling life IN FLOW. My Wellbeing Pal brings you informative, fun and relaxing training with a printed take home toolkit so you can practice at home and encorporate you have learn’t into you daily life bring you TOTAL BODY WELLBEING. As a holistic therapist I know that working with one area in isolation will only give limited results. Therefore I have created this unique workshop to help you to LOVE, UNDERSTAND and RECONNECT with your body. Our 1st couple of workshops were such a success that I advise that you sign up early to avoid disappointment as there are limited places available due to this smaller venu as I want to take this workshop on tour around Ireland. Better still why not sign a friend up and totally escape for a few hours of ME TIME to CONNECT BACK TO YOU. 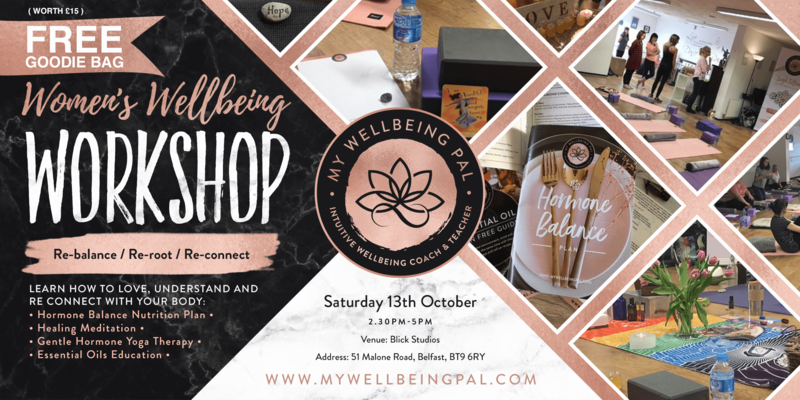 This Womens Wellbeing Workshop will take place on Saturday 13th October from 2.30-5pm in Blick Studios, 51 Malone Road, Belfast, BT9 6RY with ample access for parking. ★ The POWER & SUPPORT of women taking responsibility for their own wellbeing together with a few giggles along the way!! **BONUS OFFER: for the first time EVER I have decided to run a private coaching group post this workshop to guide people into PUTTING INTO ACTION the key principals presented at this workshop so you don’t leave with a ‘so what’s next…?’. I will let you into my life with weekly facebook live events where you can ask me question, some daily essentials oil tutorials along with key nuggets and information to help motivate you to stay on track. A personal 1:1 session with me is worth £80 and you get 4 WEEKLY GROUP COACHING sessions with me for FREE with a life time access into this small private group!! Sounds good?? It is really is but don’t take my word for it…here are some of the comments from previous attendees.